Daily Illuminator: It's A Scrambler Special! July 30, 2012: It's A Scrambler Special! It can be very difficult to tell what drives a man. It's much easier to tell what a man drives -- for example, the Joseph Special, with its front-mounted anti-tank gun and rocket launcher or its rear-mounted minedropper. And you'd likely be able to spot the Scrambler by its twin machine guns, micro-missile launcher, and oil jet. 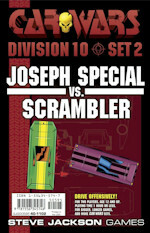 Both of these cars are described in detail -- along with the rules and counters needed to make it a complete game -- in Car Wars Division 10 Set 2 - Joseph Special vs. Scrambler These Division 10 vehicles are evenly matched for an afternoon of offensive-driving fun. Drive yourself to new heights of excitement by driving one of these vehicles . . . available now at e23!